If you were anywhere near the Central Utility Plant (CUP) in early December, you probably noticed a crane moving sections of something that looked like huge pieces of pipe into the building. Yes, on one of the coldest days of the year, we installed a new chiller. Normally this is something that only engineers would geek out about. But I’m here to tell you that this chiller is pretty, well, cool. First, let’s talk about what in the heck a chiller is. A chiller super-cools water and that water is then distributed around campus in very large pipes to provide cooling. This is much more efficient than the thousands of air conditioning units it would take on a campus this size. Our new chiller has a very new, efficient, and environmentally responsible refrigerant in it. This new refrigerant does not deplete the ozone if released into the atmosphere (as traditional CFC refrigerants do) and has the best toxicity rating possible. It’s also nonflammable and can run at a lower pressure, making it very safe. While most refrigerants today have a global warming potential of about 1300, our refrigerant’s global warming potential value is just 1!!! How “cool” is this refrigerant? Only twelve chillers in the world to have it, and we have one—and the first in the United States. This chiller is a little bigger (classified as a 3700-ton) than our existing chillers and this will allow us to cool the newly opened Lauritzen Outpatient Center and Pharmacy Drug Discovery Buildings, as well as the Fred and Pamela Buffett Cancer Center, with capacity to spare for future buildings. The refrigerant along with the size of this chiller and new controls allows us to be more efficient—not only is the new chiller more energy efficient than the old ones, it’s size allows us to run it and the other chillers at a comfortable pace. It’s like driving your car on cruise control at 60mph, rather than changing speeds erratically or driving at 100mph. We save energy and all our chillers will last longer. Getting this chiller in the CUP was no easy feat either. 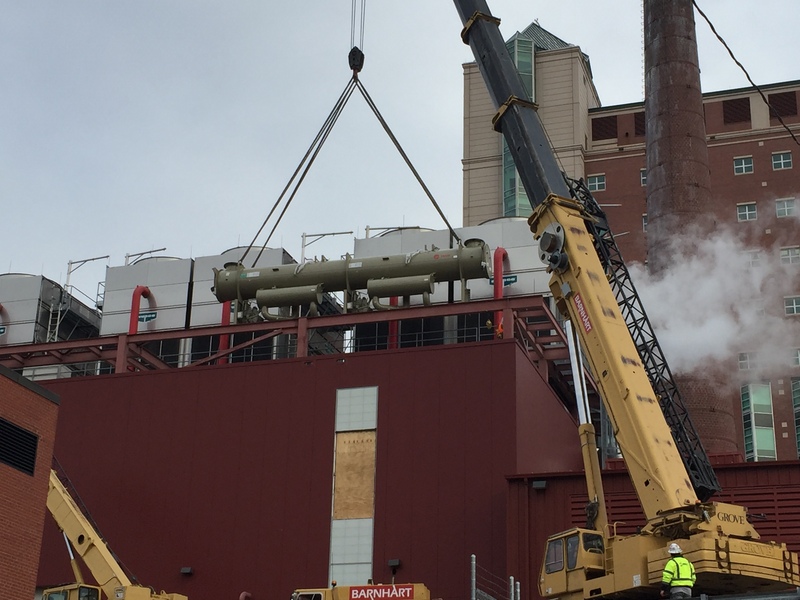 It was factory tested, shipped, tested again, disassembled into 4 pieces, and then craned into the CUP—which had a section of roof removed to get it in and special support structures in place to move the chiller to its permanent home inside the building. Previous Previous post: Have a Green Super Sunday!